This lady designed for all the biggies in Hollywood and society during the 40s and 50s, then went freelance by opening a shop on Broadway and West 158th in NYC. 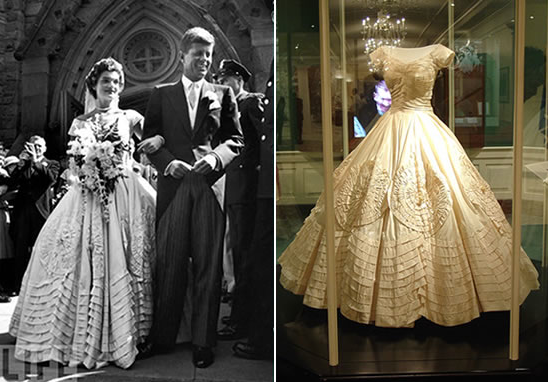 Once a president of the NY chapter of NAFAD (National Association of Fashion and Accessory Designers), she continued to create after her stint was done and went on to design the costumes used by the Dance Theatre of Harlem for nearly two decades. Retiring in 1988, she passed in 2001, aged 96 years. I do not know how to file this. History? Yes. Black History? I dunno. More like history as usual in the US. I listened and cringed and threw up in my mouth a little when I researched further.. And prayed that this, or any other type of experimentation was NOT going on anyone now. But it is. The main experiment going on now? NORPLANT. And it's global. Look it up. Yes, it's a birth control measure but....It was developed to block contraception but it will render a woman barren eventually. And who gets this as a form of birth control mostly? Poor women of all races. Think about that. Years ago when my mom was working in the medical system as a nurse, the method pushed on poor women was the IUD. In particular, the Dalkon Shield. People in the know used to call it the Dalkon Killer. Women died from using this device. Or were rendered barren due to infections, or uteri being perforated by this "miracle aid." Anyway, this NPR report gave me the heeby jeebies. 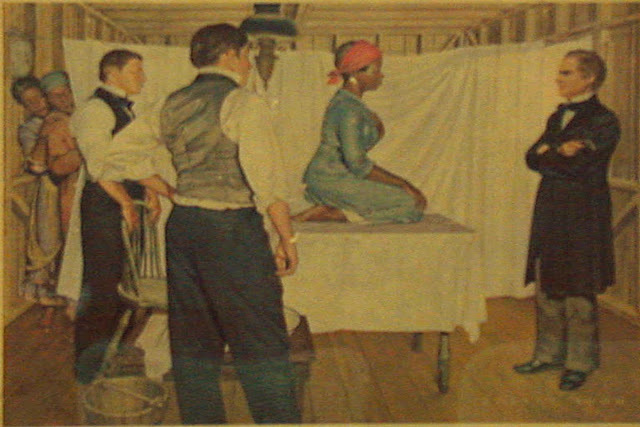 Its subjects are the "lab rats" Anarcha, Lucy and Betsy - just three of the God-knows-how-many enslaved Black women - who under the yoke, endured, for science, for a doctor's glory, the horrors of the budding field of modern gynaecology. The experimenter? 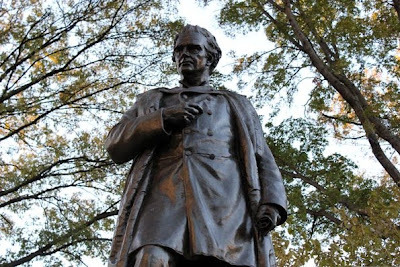 A Doctor James Marion Sims, father of modern gynaecology also known as "Father Butcher." Yikes! And do not whine to me that it wasn't racist, or that somebody had to do it. Really? If so, answer me this. Why didn't he add poor non-Black women and non-Black women of means to his experiments? Malcolm Little. "Detroit Red" (due to a Scots maternal grandfather). Malcolm X. El-Hajj Malik el Shabazz. A one-time pimp, felon, then a minister. First a Christian. Then a member of the Nation of Islam. Finally a Sunni Muslim. Initially self-absorbed then turning to a champion for Black America. Lastly a changed man and thinker. What a journey! Whatever you though of him, if you ever thought of him, you could not ignore him. Today exactly 51 years ago, on Sunday February 21, 1965 at Manhattan's Audubon Ballroom, his short 39 years of life were ended by assassins' bullets. Much speculation as to how it came about. Were minions of a disgruntled Elijah Muhammad responsible? Hoover and COINTELPRO? Random shooters? This man, and the people who had been threatening him, had been WATCHED for YEARS. Just like King. Random shooter theory? No. There were no surprises. Just folk sitting back, letting things proceed. WATCHING it all unfold. Born James Cleveland Owens, the star of the 1936 Berlin Olympics won FOUR gold medals and trounced all over Adolph Hitler's theory and display of Aryan supremacy. The new movie, "RACE" depicts the showdown between Owens and German favorite Luz Long (who gave him pointers). It has good vibes but if you are anywhere near a sentient being, White Supremacy be it in Nazi Germany or in the then klan-ridden KKK of the US just ain't conducive to the warm fuzzies. RANDOM FACTOID! RANDOM FACTOID! The South can't be blamed for every racist thing that ever went down in the US, nor can the North be always seen as that bastion of freedom. I got this news from the horse's mouth - my grand. Back in 1929, the hinterlands of that northern state, our home state, PENNSYLVANIA had more KKK members than anywhere else in the country. There actually was a hell fire and brimstone PRIEST who used to broadcast a radio show from the state, decrying how "mud people" were ruining the world or some such nonsense. Man had a whole lot of followers. Now I know why my grands used to say, "There is Pittsburgh and there is Philadelphia. Remember, Sweetie, everything else in between is PENNSYLTUCKY! To this day, I do not venture toward the Susquehannahs if I do not have to. OK, End of FACTOID. 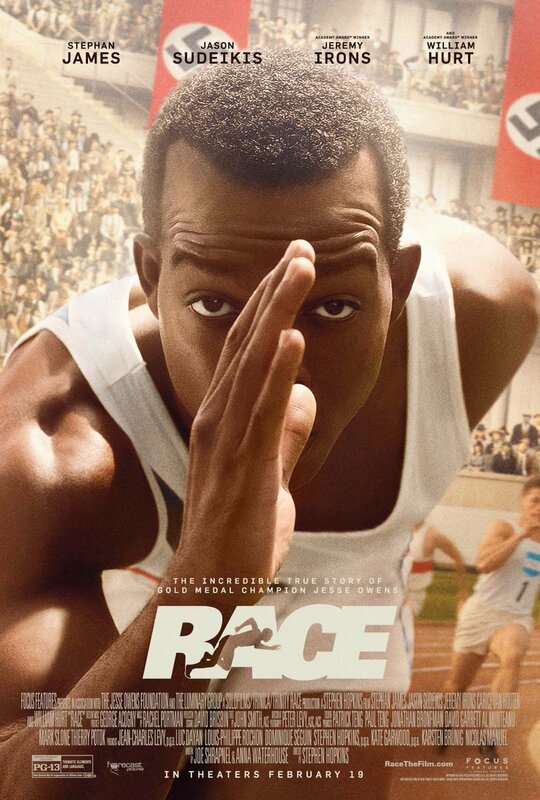 "RACE" features Canadian thespian Stephan James in the title role. The film releases nationwide on Friday February 19th. 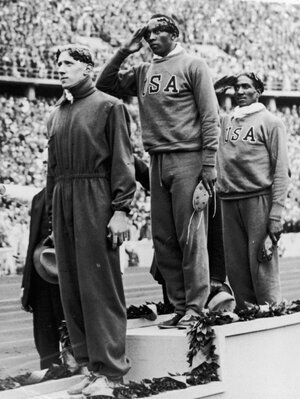 ps after winning gold for his country, Owens was the only athlete on the 1936 USA Olympic team who DID NOT get an invite to the White House. WTF! Really FDR? HBCU Hampton University has a men's lacrosse team. I said a LACROSSE TEAM! Lacrosse. That sport of the rich, that was a past time of America's indigenous people first, now has found a spot at Hampton University in Virginia. It's not the first time though that an HBCU had a winning, all Black squad. Morgan State University in Baltimore. MD had that honor in the 70s.That college's squad, THE BEARS, competed in Division I games though they were classified as Division II. The squad at Hampton, THE PIRATES, a DIVISION I team now, played in a Division I competition against Roberts Wesleyan just this past week end. They lost 20-3 but made history by virtue of their existence . Lacrosse. Wow. I'm feeling the need to don gloves, a pillbox hat, some pearls and eat a watercress sandwich. "Jeeves, bring me a Manhattan and don't be stingy with the sweet vermouth!" I'm part of a line up of SF/F authors at USA TODAY talking their favorite romance reads for Valentine's Day! Hey! I got asked my opinion, preference really, about my favorite romance book. 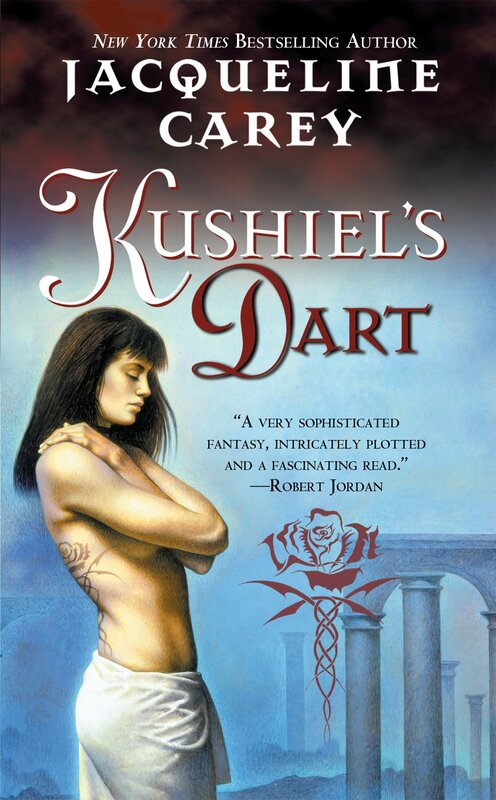 I have too many to name but the one that still sticks with me is the Kushiel's Dart series by Jacqueline Carey. Not a romance really but heavy on emotion. I give my take in the article. There is an HBO movie about this resourceful, brilliant man named, Something the Lord Made, with a damned good Mos Def (now Yassin Bey) in the starring role. The late Alan Rickman gives another of his dazzling performances as Dr. Alfred Blalock, Vivien Thomas' mentor and sometime adversary. This movie made me see Mos Def in a whole new light and I discovered another unsung, real-life, Black hero. 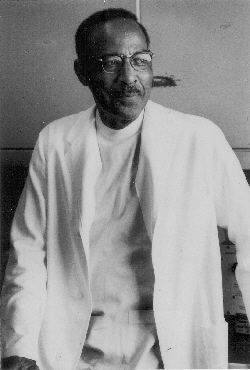 Vivien was the man who became a janitor when his dream of going to medical school died, who then through determination became a surgical technician and who then invented a life-saving surgical technique that became standard procedure. A man without medical training who ended up training heart surgeons! A man who was denied his earned place in medical history for years but finally got his due. And if I say so myself, was a hottie on top of it all! Read about this driven soul. Glowing, lovely review for KINDRED, AN AMERICAN LOVE STORY! Some days I wonder why I write and some days I wonder why others write but today this news lifted me out of a funk I was settling into comfortably. 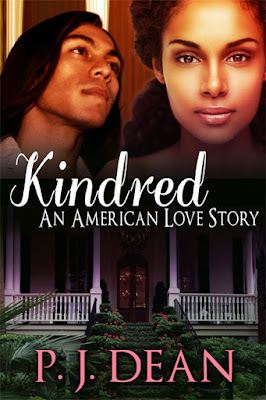 I got a positive, wonderful review for my historical. 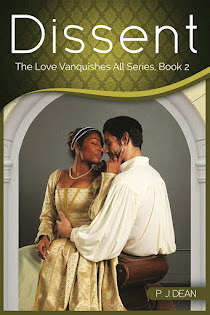 Reviewer Sharonda at Brazen Babe Reviews lurved my book. It got 5 Brazen Babes and is a top pick! The unexpected review made my day and I could listen to an Earth, Wind and Fire song without tearing up. Thanks, BB! Like James Brown sang, "I feel good!" Here's the link it you wanna peruse the review and the site. MAURICE WHITE - EARTH, WIND AND FIRE IS DOWN ONE! DAMN! I am devastated. My heart is in pieces. 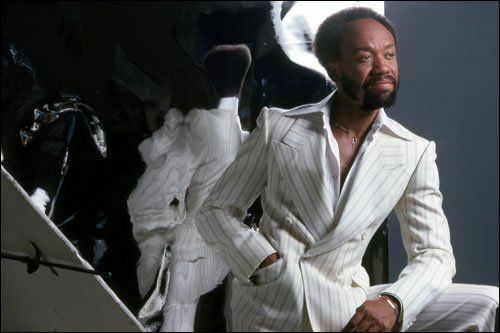 The frontman, Maurice White, of one of the all-time great funk, RnB, Latin, jazz, pop, rock, disco, African, soul (they did it all!) bands has made his transition! 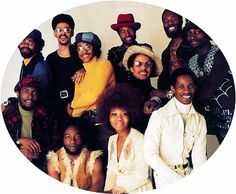 In all my youth, into adulthood there has never been a time that I have not had EARTH, WIND AND FIRE in some sort of way in my life! Oh freakin' man. Their music was, is as spacey and spiritual as David Bowie's. And you had not lived unless you'd seen them open for CHICAGO. The songlist is toooooo long to post here but they are easily searchable. BUT..my favorite song written by Mr. White is "KEEP YOUR HEAD TO THE SKY." A great, gone on to perform in the heavens. Bye, Maurice. Glad to have experienced your gift. "KEEP YOUR HEAD TO THE SKY"
Throw Back for days! This line up is appearing at the Tropicana Hotel in Atlantic City this Valentine's Day! Oh, to be there! Oh man. Music heaven. The Dramatics, the Stylistics, New Birth and Bloodstone. Two more smooth male groups and two psychedelic, New Age types. This is a fantastic bill and I'm jealous at whomever has tickets. Just good sounds all around. And the Stylistics are from Philly. Represent! Listen and enjoy Valentine's Day if so inclined.